Two weeks ago, the GOP’s leadership in the House and Senate sent an extremely high-profile letter to Ben Bernanke, asking him to think twice before engaging in some more quantitative easing. In the end, the Fed went with a “twist” maneuver, defying the GOP. Again, that was two weeks ago. Today, reporters pressed Cantor on the decision. He elided the question three times. Q: Mr. Leader, you signed a letter with other Republican leaders urging the Fed not to take more action to ease monetary conditions, and that advice was in the main rejected or ignored. How do you feel that Chairman Bernanke is doing? Do you still have confidence in him as Fed Chairman? CANTOR: Listen, I met with Chairman Bernanke not this year, but one on one prior to that, and certainly a very bright man. He has got a tough job. And, you know, we are all looking to see that he is successful and that we can get this economy turned around. Q: To follow on Jim’s question, do you have confidence in Chairman Bernanke? CANTOR: I have confidence in the fact that everybody intends to try and do the right thing in bringing us forward. And so your “yes or no” may not suffice here. I have confidence that Ben Bernanke is a bright guy, and he is trying to do what he feels is best given a very troubled economy. Where our focus should be, rather than opining as to the prowess of the Chairman or his team, is on the work we have to do ourselves. Q: Leader Cantor, you signed a letter criticizing the Fed. 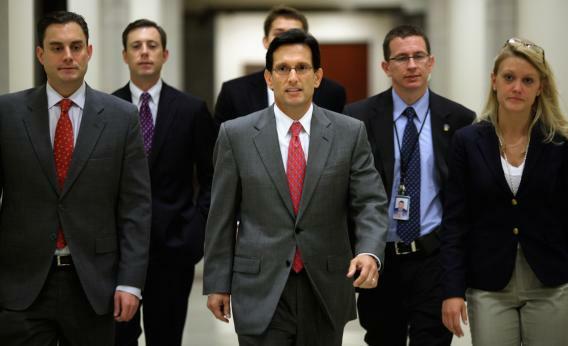 CANTOR: Go ahead. I think I have dealt with that question. There will be no continued Fed-bashing right now.